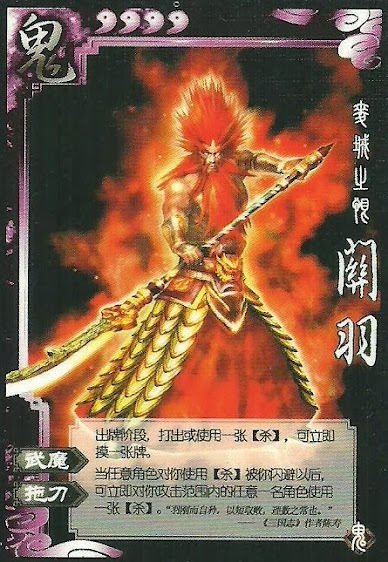 Whenever Guan Yu uses an attack during any action phase, he can draw a card. Whenever Guan Yu escapes an attack, he can use an attack to any player within his attacking range. When Guan Yu uses "Dragging Blade", he does not need to target the same person that attacked him. He can go after anyone that he can reach. Guan Yu can only use "Demon of War", during an action phase. If it is a different phase, he won't get to draw a card. If Xiahou Yuan skips drawing to attack Guan Yu, who then escapes it. Guan Yu could still attack someone, but he will not get to draw since it is still Xiahou Yuan's drawing phase.